Big Hops -- Craft Beer On Tap - To Go! a variety of only the best craft beer available in San Antonio. The Ultimate Craft Beer Destination! Craft Beer on Draft – to go! Bringing you the best craft beer in San Antonio! Want to be a Big Hops owner? 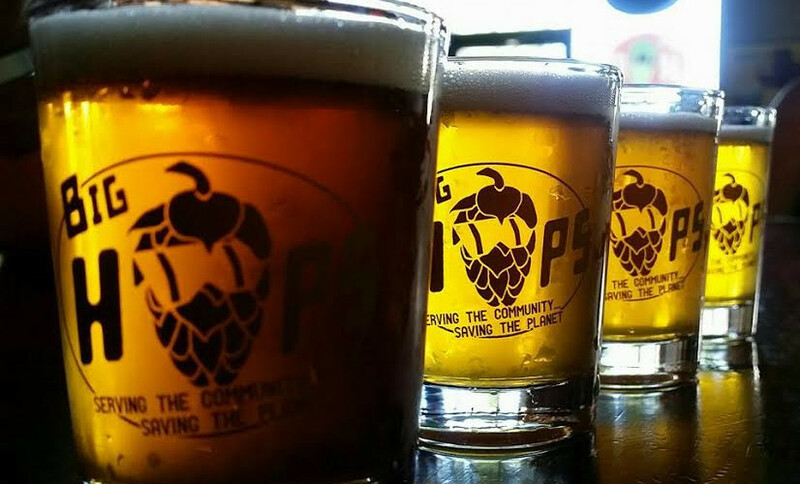 Big Hops is a true craft beer bar specializing in local brews. We serve craft beer, wine, mead, and cider, as well as other non-alcoholic drinks. All of these are available to our customers for on and off premise consumption. Our draught wall uses a “rotating” system developed to provide an ever-changing selection of craft beers for our customers. We have found this rotating tap wall system to be very effective for our business in minimizing costs relating to beer line maintenance, cooler space, menu effectiveness, upfront investment, and many more. Big Hops is a neighborhood gathering place. Decor, beer menus, suppliers and ties to community causes are localized. Music and event volumes are kept at levels enhancing conversation. Our beer bars are bright, open and interesting. We celebrate beer while leaving the brewing to the experts /local breweries. Big Hops was designed from inception to provide a premium craft beer experience. Big Hops franchising combines America’s rapidly growing obsession in craft beer with the power of franchising. As a business model it has a relatively low financial entry level, can be a perfect transition into franchising for new operators, and an easy addition to multi-unit portfolios. Who are we looking for as a Big Hops Franchisee? ** Does not include real estate, based on square footage. This information is not intended as an offer to sell, or the solicitation of an offer to buy, a franchise. It is for information purposes only. An offer is made only by a Franchise Disclosure Document (FDD). Big Hops franchises will not be sold to any resident of any state until the offering has been exempted from the requirements of, or duly registered in and declared effective by, such state and the required FDD (if any) has been delivered to the prospective franchisee before the sale in compliance with applicable law. "To promote and support the craft beer community through our customer service, our products, and our culture... We are Big Hops!" This site is intended for audiences of legal drinking age only. All the names of breweries and products are trademarks and the property of their respective owners.